Here are the most fun things to do in Key West, Florida, on vacation! Key West is a fabulous vacation venue packed with exciting activities for the whole family. Explore the Island on a fun hop on and off trolley while you learn about the culture and history. Then get onto the water and spot dolphins and sharks. Sail on a luxury catamaran to a distant protected Park and learn how to scuba dive to explore the magnificent underwater scenery. If you enjoy mysterious spine-chilling stories, go ghost hunting at night. 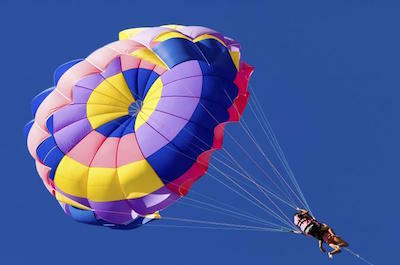 Be brave and see the Island from high up in a helicopter or on a parasail. Swim, snorkel and then relax on the beach with an exotic drink and a platter of traditional snacks! Start your trip with the most amazing thing to do in Key West! Watching dolphins will create memories to last a lifetime. Take a loved one and head for the harbor where you will climb aboard a luxury catamaran for a three hour trip. There are unlimited drinks on board, so grab a cocktail and sit back. 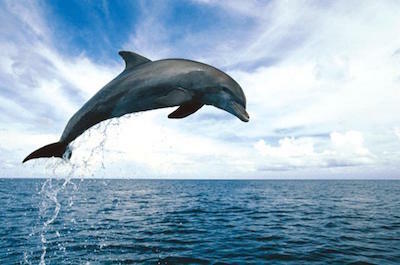 As you sail along, admire the scenery and soon you will be awed to see dozens of dolphins swimming alongside your boat. These bottlenose dolphins will play, feed and jump out of the water right next to you, perfectly happy in their natural habitat. Your boat then heads to a magnificent coral reef where you can choose to jump into the water and explore the stunning colorful marine life. All equipment needed, a snorkel, fins, vest and mask, are provided and a quick safety lesson gets you going in no time. After your dip, relax on the shaded deck and enjoy a delicious lunch while you chat to new found friends. 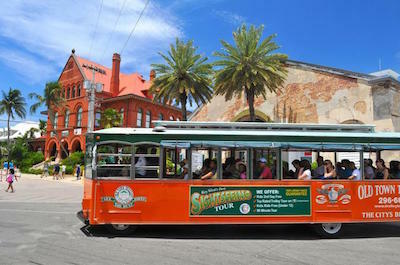 Discovering the city on a hop on and off tour is a fun thing to in Key West for the whole family. You can take your time, explore the sights that interest you and relax as the trolley bus takes you from one fascinating point to another. The bus stops at over 100 places of interest and an expert guide is on board to get you up to speed on the culture, history, lore and legends of Key West. You will also be entertained by fun insider stories and tips as you travel along. You decide where you want to get off and for how long. Then simply wait for the bus and jump back on again! Visit popular sites like Mallory Square where you can stop to eat and shop. See the famous HogÕs Breath Saloon, Ernest Hemingway House and Museum and the Bahama Village Market. Kids will be thrilled at the Key West Aquarium and Key West Shipwreck Treasures Museum. Visit Key West's famed beaches, the Mel Fisher Museum and the beautiful Butterfly Conservatory. If you love exploring underwater life, a snorkeling tour is the next fabulous thing to do in Key West. Choose from a selection of great tours that can be combined with kayaking, dolphin watching or even visiting a ship wreck. All tours are totally safe and are overseen by professional and experienced guides who will tell you all about this fascinating venue. Equipment is provided and a quick safety briefing for beginners will have you diving in no time. Set off the to coral reef where you can discover over 600 different species of marine life. Sponges, corals, sea turtles, dolphins and colorful fish will keep you mesmerized. Row on a kayak if you are fit or relax on the deck of a luxury catamaran. Explore mangrove forests after your snorkeling trip or head out to a shipwreck where you can see exotic marine creatures that have made it home. Depending on the duration and time, tours include breakfast, brunch, lunch and drinks. Tropical fruit trays are also provided for your enjoyment. Fit and ready to test your rowing skills? Joining a kayak tour is a great thing to do in Key West. 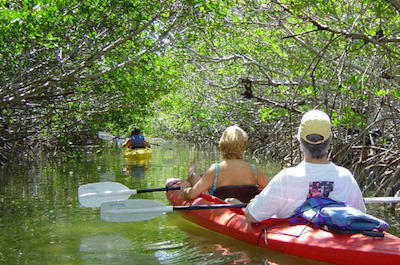 Follow you guide as you kayak through the dense maze of mangrove-covered canals and streams. Look out for a huge variety of tropical birds, rays, sharks, sport fish and more. When you get hot, jump into the water for a snorkeling session. The coral reef has over 600 different species of aquatic life. You can also choose a short eco-kayak trip where your knowledgeable guide will tell you stories about the geological structure of the Florida Keys. If you have a longer time to spend, join a tour that takes you to a remote sanctuary, known only to Key West locals. Enjoy a light meal and set off to this remote spot. When you arrive, enjoy the untouched beauty, swim, snorkel, relax on the sand or take a walk. For beginners, the Geiger Key Backcountry Kayak Eco Tour takes you in shallow waters where you will explore the mangrove creek, gliding across the shallow grass flats looking for sea creatures, birds and animals. This is an easy paddle, ideal for all ages and requires no previous experience. Be brave and daring and do something you would never do! A parasailing adventure is the next adrenaline-pumping thing to do in Key West. Experience the thrill of flying while you also get a birdÕs eye view of the stunning scenic beauty of Key West and the Gulf of Mexico. Your guide will give you a safety briefing and get you seated and secure. The take off and landing are dry, so donÕt worry about your hair-do! As you sail upwards to 300 feet, feel the calm and tranquillity of the open sky as you gaze down on the crystal clear waters and see the activities on the coastline. Spot people on the beach, dolphins and sea turtles in the water and ships on the horizon. On a clear day, you can see as far as 12 miles! 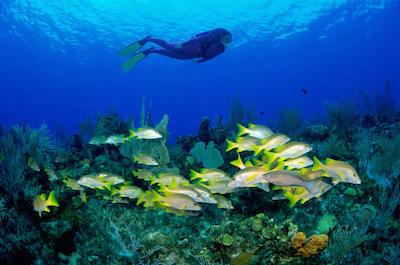 Trips can be tailor-made to suit you - choose wild or mild but do not miss out on this fabulous thing to do in Key West. If you think that Scuba diving requires certification and all sorts of red tape, think again. This No Certification Guided Tour is designed for beginners and is the perfect thing to do in Key West. Diving Key West specializes in taking beginners scuba diving for their first dive experience and they guarantee that you will want to come back for more. Knowledgeable and professional instructors teach you everything you need to know and all the gear is provided. The dive site is on the worldÕs third largest barrier reef in the world. Your controlled dive takes place on coral reef systems that are protected and located inside a marine sanctuary. You will see an abundance of aquatic life, tropical plants, colorful fish and beautiful corals. The tour is a private adventure operated for just you and your party of friends. When you surface, catch your breath and enjoy a free drink. You also get a free underwater GoPro video to show off when you get home. 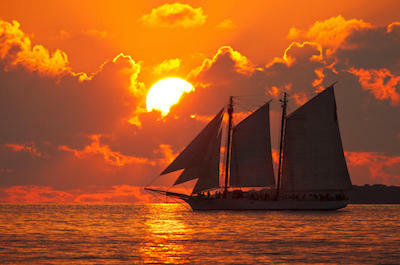 Get out onto the water and enjoy a day of sailing, our next recommended thing to do in Key West. 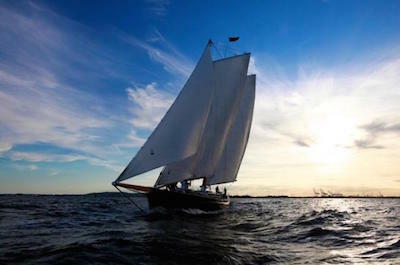 Head for the harbor and climb aboard the massive and imposing schooner known as Appledore. This historic two-masted tall ship is an iconic feature at Key WestÕs famous seaport. Help the crew to raise the sails and embark on a breath-taking 5 hour adventure into the crystal blue waters of the Atlantic Ocean. If you are up for a challenge, you can take the captainÕs wheel and steer past some of Key West famous landmarks like Mallory Square, where everyone will stop and wave as you sail past. Enjoy a fabulous buffet lunch of fried chicken and steamed shrimp. You can also choose sandwiches and different salads. Wine, beer, soft drinks and home-made sangria are also included. After lunch, if you are up for ore fun things to do in Key West, put on snorkeling gear and jump into the water to explore the depths that are home to a myriad of fascinating aquatic creatures. If you prefer, simply relax on the deck and soak up the sun. Want to romance a loved one or go down on one knee and ask that heartfelt question? Nothing will beat the setting of our next suggested thing to do in Key West Ð a stunning sunset cruise on the ocean while sipping Champagne! Meet your personal guide at the Port and set off for a 2 hour cruise with a small group of only 14 passengers. 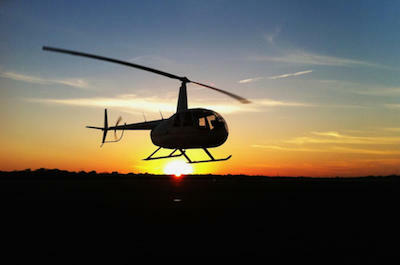 The tour departs in the late afternoon and you will have a spectacular view of the setting sun. Enjoy a glass of Chandon Brut champagne, there are three different varieties to choose from. You can also sip some wine or have an ice-cold beer, a soft drink or bottled spring water. When you get hungry, there is a fabulous gourmet cheese buffet on deck to tempt as well as fresh fruits, berries and other snacks. Then settle down and enjoy the sun setting on the horizon, a perfect end to the day. Looking for some fun and eerie adult entertainment? 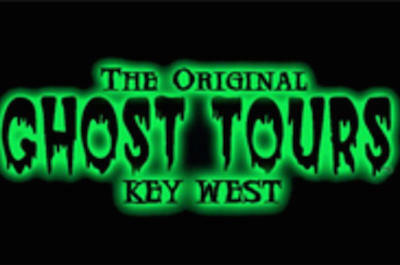 Our next suggestion is a spine-tingling thing to do in Key West. Get your group of friend and explore the paranormal and spooky side of town. Go to bars located in haunted mansions where your guide will tell you about the people who died there! Then visit a former morgue and learn why Key West was once called Bone Island. 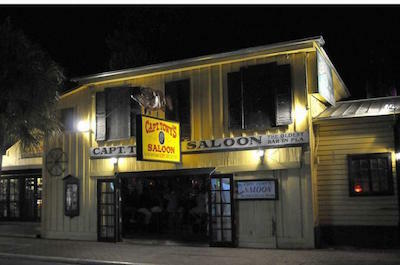 Pop into Captain TonyÕs Saloon, one of Ernest HemingwayÕs favorite spots for a drink and learn how it once doubled as a morgue. Visit Hard Rock CafŽ, a famous bar that is located in a mansion with tragic histories. A strong drink is offered at each venue to steady your nerves. Stroll down the ancient, dark, narrow streets that are lined with 19th century homes, hiding gruesome secrets. Your guide will tell you all the gory stories and will have ghost hunting equipment on hand, if you brave enough to use it! This is walking tour, so wear comfortable shoes. They will also help to run run away from ghosts and other apparitions that may appear at any time. If you love the outdoors and have a day to spare, an amazing thing to do in Key West is to join a day trip to Dry Tortugas National Park. Set off on board the Yankee Freedom III, a luxurious, high-speed catamaran. Enjoy a scrumptious breakfast on board while sailing 70 miles through the Gulf of Mexico. Your guide will update you on the surroundings and the history of the Park which is located inside Fort Jefferson. The cluster of seven islands will delight with coral reefs, a huge variety of bird and marine life and amazing stories of pirates and hidden treasures. Take a tour of the Fort and then walk along the pristine beach and pick up seashells. Do some snorkeling to discover the magnificent aquatic life under the water. You will also have the amazing experience of getting close to dolphins and sea turtles. After your swim, enjoy a delicious buffet lunch and spend the afternoon exploring the stunning scenery for more cool things to do in Key West. Climb back on board in the late afternoon and enjoy a magnificent sunset sail back to Port as you sip an exotic Caribean drink. Now is the time to conquer your fear of flying! Our next fabulous thing to do in Key West is to take a helicopter tour and see the sights from high up, an exhilarating experience. Meet your personal pilot, get seated and set off to see the historical city landmarks and Key WestÕs famous marine life. He will point out dolphins, sharks, stingrays and sea turtles feeding in their natural habitat. You will be able to see parts of Key West that are only accessible by water or air. For some extra fun, ask your pilot to fly over your cruise ship! Then see the famous Seven Mile Bridge on the way to Pigeon Key and the historic Sombrero Key Light. For a romantic trip, join the Sunset Celebration, perfect for couples. See Key West from above when the crowds gather at Mallory Square. Sip a glass of champagne and watch the glorious sunset as the sun disappears behind the horizon. Now is a good time to pop that famous question or renew your marriage wows! After a day of sea and sun. nothing beats a great drink with the friends in a local pub. The Island offers a host of famous night-life venues and exploring them is a great thing to do in Key West. Join a fun and wild Pub Crawl called the Duval Crawl. Follow your guide and see the most lively and entertaining establishments in the Florida Keys. Walk down the vibrant downtown streets to the historic bustling seaport area and then back again to Duval Street. Enjoy stops along the way and get refreshed with an exotic Caribbean drink and dance to some live music before setting off again. Try some speciality offerings like a frozen pina colada or mixed rum drink and donÕt miss the legendary Caribbean Breeze at Rick's Bar. If you want to add a touch of the mysterious, join the Haunted Pub Crawl and learn all about the spooky and eerie history of the old bars. Participants must be at 21 years or older. Collect your free T-shirt to show off when you get home. Enjoy a different adventure! 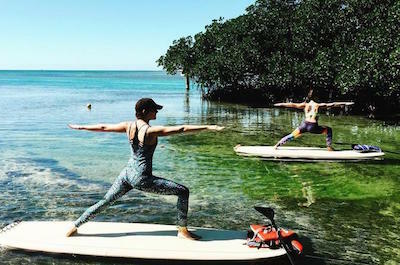 Paddle boarding is a fun thing to in Key West and is suitable for the whole family. No previous experience is needed, your guide will give you a quick lesson and you are set. Set off for a 2 hour trip paddle boarding tour of Key WestÕs mangrove ecosystem. You will paddle slowly across the shallow waters of the backcountry while learning all about the geology of the Keys and the bird, animal and marine life that lives here. Spot tropical fish, jellyfish, sea cucumbers and aquatic birds as you explore the mangroves up close. If you are a fitness fanatic, try something new! The paddle Fit class will have you exercising mind and body on a paddle board. This session lasts for an hour and offers a fun and challenging workout that focuses on strength, endurance, balance and functional movement. Then follow your guide on a leisurely paddle to explore the waters of the mangrove creeks. You may even spot a ray or shark! 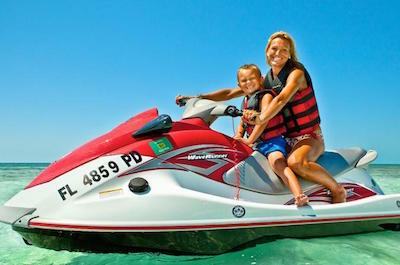 Become a pirate of the sea Ð on a Jet Ski! Taking a 27 mile jet ski tour around the island is a not-to-be-missed thing to do in Key West. Follow your professional guide on a breath taking ride around the island. You will see all the points of interest from the water! No previous experience is needed. Your guide will give you a quick lesson and safety briefing and will be with you at all times ensuring that all runs smoothly. Explore the famous sand bars in the Atlantic Ocean and ride the waves through the Gulf of Mexico. Then explore the backcountry and see the mangroves, islands and exotic birds in their natural habitats. Enjoy the panoramic island views only seen from the water and look out for dolphins, stingrays, sea turtles, manatees and other marine creatures. When you get back to land ask for a beer if you are over 21 or a refreshing drink if you are younger! 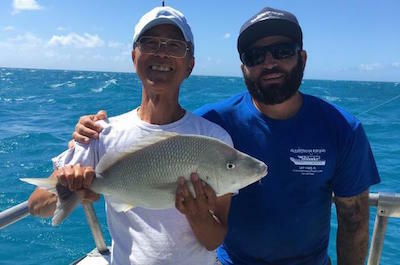 Nothing beats that photo of you with your massive catch and taking a private fishing charter is the next awesome thing to do in Key West. Meet your captain and set off into the deep waters on a private tour. Your vessel is the 34 foot Hook and she knows where to find the best catch. From blue marlin, wahoo, sailfish, dolphins and tuna to giant sharks, snappers and monster groupers, you will find them all. The boat sails into the open water and along the reef, giving you a taste of both. You will be taught and helped with baiting your hooks and casting your lines. Relax and wait for the bite! If you have a large group, join the Party Boat which can accommodate up to 60 passengers. Partying, eating, drinking and fishing at the same time make a fabulous thing to do in Key West. When you arrive back at the harbor, snap those photos and then enjoy a drink while your catch is prepared by a local chef for your dinner.